Have your cheese ball for dessert and enjoy during your next tailgate party. Beat cream cheese, butter, and vanilla in a medium-sized bowl until fluffy. Add sugar and beat until combined. Stir in ¾ cup mini chocolate chips. Cover and refrigerate for two hours. To make the football shape, mold the chilled cheesecake by hand or line the inside of a football-shaped bowl with plastic wrap then fill with the cheesecake. Cover the top with plastic wrap. Refrigerate for at least an hour. To decorate and serve, remove plastic wrap from the top of the cheesecake ball and invert cheesecake ball onto serving platter. Remove remaining plastic wrap. 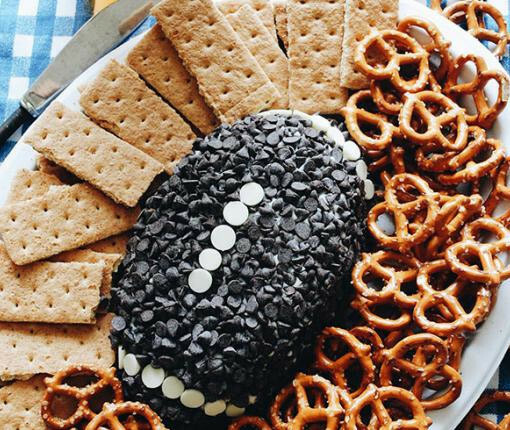 Decorate by covering cheesecake ball with remaining mini chocolate chips. To add accents to resemble football laces, add in white chocolate chips to the center and top sides.